How to make sushi rice? This is probably one of the most fundamental questions when it comes to Japanese cuisine, thanks to the increasing popularity of sushi in the world. Home cooks who are interested in Japanese cuisine will ultimately want to learn how to make perfect sushi rice—the vinegared rice which is the building block of all sorts of sushi. Other than the rice, the most important ingredient is the rice vinegar, which is pretty much the soul of the sushi rice. The sugar and salt are added to flavor the sushi rice to one’s liking. Therefore, a perfect sushi rice starts with a good rice vinegar and I always use Mizkan Rice Vinegar. 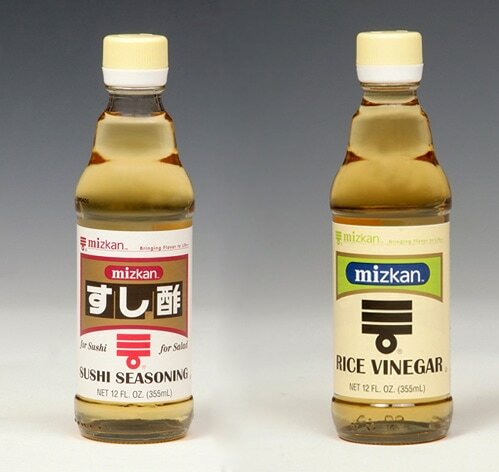 As the #1 brand for vinegar and vinegar-related condiments in Japan, Mizkan is the brand that my Japanese friends recommended when I first learned how to make sushi many years ago. If you want something easier, you can use Mizkan Sushi Seasoning, which is widely used in Japan. This all-in-one sushi seasoning has the perfect and authentic flavor so anyone can make sushi if they want. Use only high quality Japanese white short-grain rice. You can get the rice at Asian supermarkets or Japanese food stores. Wash the rice thoroughly with water before cooking. The rice is ready to be cooked when the water becomes clear—an indication that the “starch” coating the rice is completely washed off. Use an electric rice cooker to cook the rice. Add rice vinegar or sushi seasoning right after the rice is cooked, mix it while it is hot and then cool it. Preferably, use a wooden bowl and spoon to prepare the sushi rice. Traditionally, sushi rice is made in a wooden tub called hangiri. Always use fresh sushi rice to make sushi. Refrigerated sushi rice loses its original texture. Stay tuned for the next installment as I will be sharing my hand roll recipe with you. Learn how to make sushi rice with this easy sushi rice recipe. 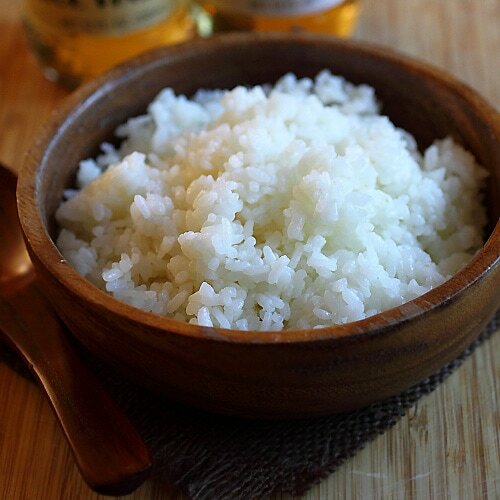 Sushi rice can be made easily with Mizkan rice vinegar or Mizkan sushi seasoning at home. Cook the rice in the rice cooker. Once cooked, transfer the rice out in a bowl and add the Mizkan Rice Vinegar, sugar and salt (OR the Mizkan Sushi Seasoning) into the rice and mix well with a spoon. Let the sushi rice cool to room temperature. Use the sushi rice to make the sushi of your choice. What brand of Japanese rice would you recomend? I use Kagayaki Select Premium Short Grain Rice, but you can also use any of these brands: Botan, Kokuho Rose, Tamanishiki. Botan Rice is a good brand to use. Correct, and I think it’s pretty easy to find. Please read my comment posted on 12/9/2010 about Sushi Rice. That I usualy do which I learned from my mother in Japan. Enjoy ! Thanks for recipe. I have never made sushi rice at home. Something to consider :) I hope everything is going well for you. Hi Ivy, thanks, I am well! Yes, do try out making sushi using this sushi rice recipe. I use medium grain rice NISHIKI, after washing rice, keep rice about 1 hour without water, then add water little less than instructed (If there are water level lines in rice cooker for amount, water level below the line of your rice amount.) After cook, mix hot rice with a spoon in pot, give air between rice and brake up stiffness. Move cooked hot rice in wide mouth bowl, add vinegar mixture all over, mix rice with a spoon but cutting motion ( do not pat-a-cake, it will be mashy ), same time you can give bleaze with a fan or paper. This will help to dry vinegar, and make shiny vinegared rice. Do not cool down completely, little warm or room temprature rice to shape your Sushi. Etsuko, thanks for your tips for making sushi rice. Can you use Hinode Rice? Thanks for sharing detailed instructions on how to make sushi rice. Thanks Ellie. Hopefully you will get to make some sushi using this sushi rice recipe. Need to stay far when adding rice vinegar into the hot cooked rice? I remember the evaporated vinegar makes my nose feel sensitive. Watch out for GMO (genetically modified) soy sauce w/sushi!!! Get organic or soy alternatives to be safe! Get organic rice too! Learn about GMOs – scarey stuff! Can you recommend a reasonably priced rice cooker? I think much more useful recipe would be without rice cooker. How many people have rice cooker at home. There some ways to do it without rice cooker. But it is not perfect ofcourse. I’ve noticed some other sites ask to heat up the rice vinegar in a pot, while adding the sugar and salt to melt it down. Are there pros and cons to this method or is it just another way of making sure that the elements of the seasoning is all melded as one? how much water do I add to the rice to cook it so it could be the right texture? I think adding some sugar in the sushi rice isn’t a good idea. It may destroy the texture and isn’t so good as the authentic one. I hope that my advice can help you to improve your talent.